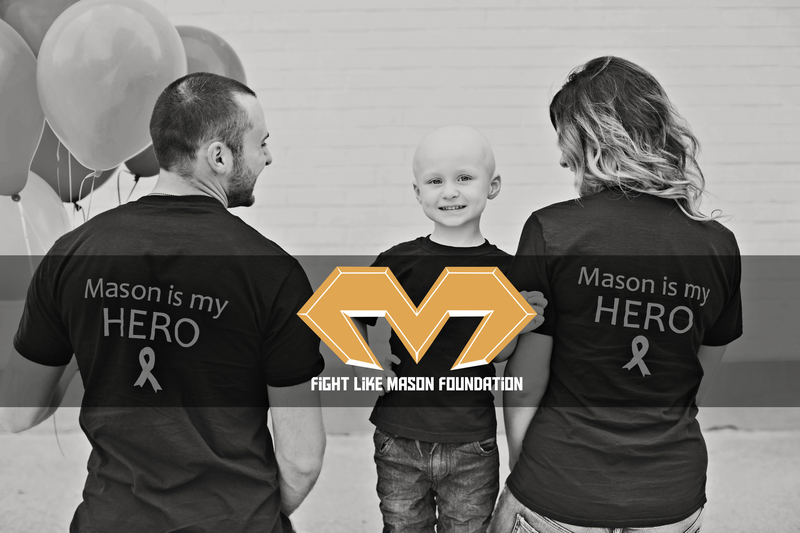 The Fight Like Mason Foundation is a Regisitered Charity organization formed by Iain Macri & Chantelle Bacon, parents of Mason Bacon-Macri. Mason is our son who was diagnosed with Rhabdomyosarcoma (a form of childhood cancer) on May 4th 2015 at the age of 2. Mason fought this terrible disease head on, like a superhero, because he was a superhero. We thought, we would do Mason no greater honour than to carry on his name, way of life and legacy in the form of a foundation. To turn this life-shattering tragedy of losing a child into something positive. With our experience, we pledged to change and make a difference, to give these kids a chance. Childhood cancer is a terrible, ugly reality that is somewhat sheltered from most of society, and is not as “rare” as it is always deemed. There are so many families that are shattered, broken and suffering from something that is of no choice of their own. This disease is in no way “rare” to any family going through it. We would like to do our part, in honour of Mason to try to improve that for the next family and child until we no longer have to. To improve treatment, care, quality of life and awareness of patients diagnosed with childhood rhabdomyosarcoma and other childhood cancers. Talking. Cancer is a disease that needs to be talked about at all ages but especially childhood cancer. The awareness of childhood cancer, its lack of funding, the community knowledge of those families that are effected by it, are facts are needed to be known.We plan on being involved in the community through fundraising, events and appearances. The Facebook page has garnered ~ 15K followers and has been a great source of support. We will continue updates and blogposts of Mason’s Fight to engage the community, raise awareness and educate the public of childhood cancer and rhabdomyosarcoma. Local community comforts and smiles. Improve quality of life for children facing life-threatening or non life-threatening illnesses that require medical supplies in the home.Our foundation plans to purchase and customize kid friendly medical equipment like IV poles. Purchase and customize children’s hospital beds to make them more inviting and appealing to a child. An example may be a race car hospital bed for boys, princess castle bed for girls. Kids do not want their only safe zone (the home) turning into a hospital. This way if home care is necessary their experience can be that much better.These will be donated to local Community Care Access Center in Windsor-Essex County.When Mason was terminal, his house became the hospital and did not want to go near the uninviting, cold, overused community hospital bed. This is an area of care is is often neglected. Defeat the villain for good. Our foundation will donate raised funds to research institutions and/or research programs focusing on newly developed treatments techniques, drug targets, specifically for childhood rhabdomyosarcoma. Childhood cancer only get 4% of the overall funding from the NCI (National Cancer Institute). Opportunities for childhood cancer researchers are few and far between. These kids deserve the world, these kids deserve a cure. The only way that is going to happen is to put money into specific research programs and projects that share this common goal.We will partner with C17 Council and Childhood Cancer Canada to assist in finding novel research to individually assist in funding a specific promising project. The research will be followed from the start with updates given to the donors as it progresses. When a loved one, family member or someone close to you gets told that phrase. A phrase that will play over and over again in their mind. A phrase that shutters them to the core, makes their whole world stop, and their entire past present and future comes rushing in all at once. A phase that they will never forget. How does someone actually “fight” cancer? Is it painstakingly struggling through every day? Getting pokes, prods, scans, tests? Going in for chemo week in and week out ? How do you fight cancer? You fight it like Mason. You can probably guess how many times he was thumbs down. Mason looked at his life NO MATTER the situation with a big “thumbs up”. He made sure regardless of what he was going through that he would do his best, to find the best out of what he was dealt. His outlook on life was one that we all should share. Back in August 2015 an amazing artist by the name of Rob Chope gave us our Maseman. He beautifully captured everything about our Mason. His drive, strength, courage, determination, will and soul all come through in one picture.He designed him a costume fitting to fight alongside his favourite heroes. Every great superhero is not just a person. The character they embody makes them much more than that. They become a symbol. A symbol for the community they protect. A symbol for what they represent, for everything they are. Just like Batman’s bat signal represents safety, justice and a promise and Captain America’s shield+star stands for truth, right and freedom. So too does our Maseman’s M represent will, courage and strength. There is no better a fitting for the representation of our foundation then the M. It’s not just a logo. Its a symbol, a pledge to Fight Like Mason and to Fight this disease once and for all.